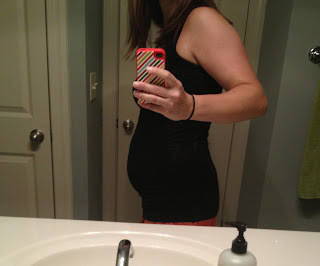 I was looking back at the “secret” blogs that I’ve been keeping, and it looks like after the 9 week post I fell off the wagon. Whoops. Luckily for all of us, I sent my Mom and my Mother-in-law an “update e-mail” after my 12-week appointment, which refreshed my memory on the events that occurred. I guess the only thing to report from then until now is that I had a doctor’s appointment at 12 weeks and had part one of my “first trimester screening” done. See explanation of what they test for from my first pregnancy, but basically I weighed in and gave a urine sample as usual, saw the doctor, had some blood drawn and got an ultrasound. I saw Dr. G this time around, whom I love, and she was in and out very quickly. My blood pressure was still fine, and was still lower than last pregnancy, which I was pleased about (although I can't remember/didn't note the exact number). Dr. G was pleased as well, although she did disclaim that preeclampsia does not typically present this early in the pregnancy. My urine was protein-free, and at 12 weeks I had gained 2 pounds. I was pretty proud of this fact until I looked back at the blog and noted that I hadn't even gained a full pound at this point last time around. Sigh. The ultrasound portion of the appointment was obviously the most fun, and we got some great photos. 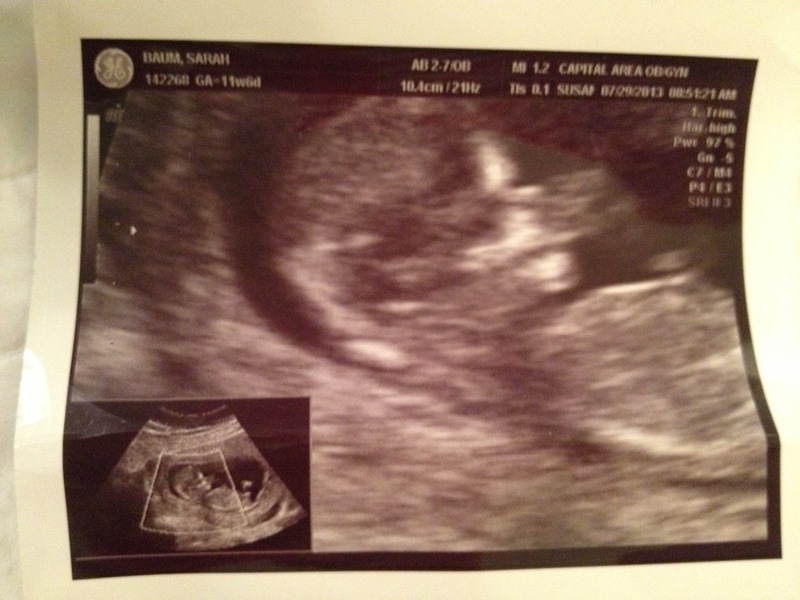 It appeared per the ultrasound that our chances of Downs or Trisomy 13 are very low and that Baby Baum 2.0 is perfectly healthy, but the blood work would confirm. Baby’s heart rate was 154 beats per minute, which they said was normal. I looked back and found my post about Lilly’s first trimester screening and her heartbeat was 148 bpm at that appointment, so who really knows what that means. This baby also appears to be very mellow compared to Lilly. 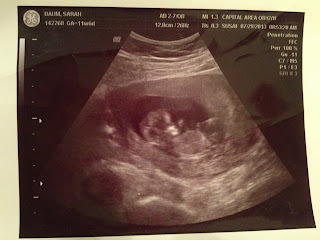 I remember that even before I could feel her moving, at every ultrasound L was a wiggle worm and moved all over the place. This baby just chilled the entire time. 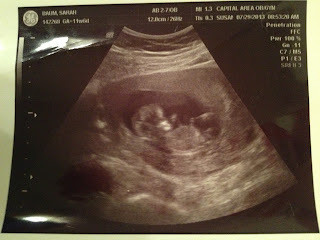 The ultrasound tech even said, “Well, it appears that this one is going to be your mellow baby.” I guess we’ll see! 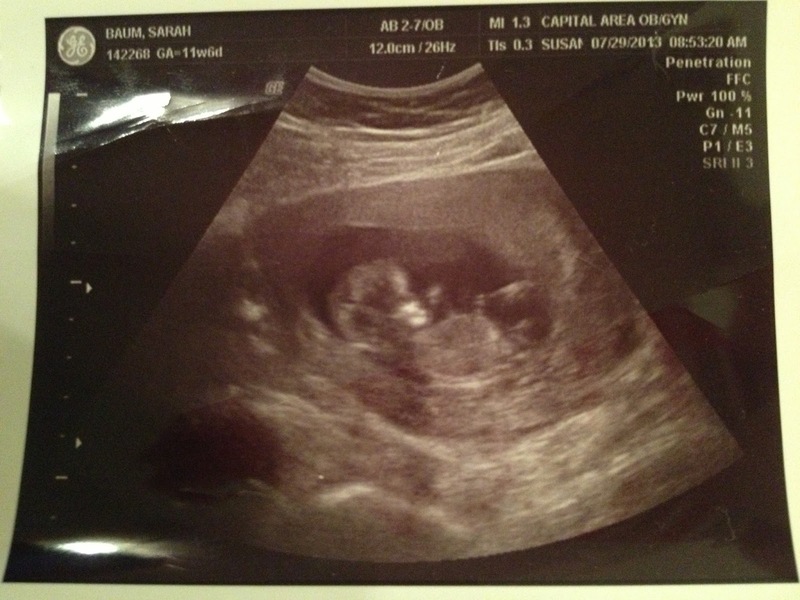 The ultrasound tech was able to see a lot and the baby was cooperative, so we got a lot of 12-week photos. Looks like Baby Baum 2.0 may already be a thumb sucker in utero just like his/her big sister! We brought home around 10 photos, but I'll just post the photos below where you can tell what you're looking at, ha. Disclaimer: sorry for the poor quality iPhone photos! Dan thinks it looks like a boy. He keeps saying things like, "don't you think this one's ultrasound pictures look more like a boy?" 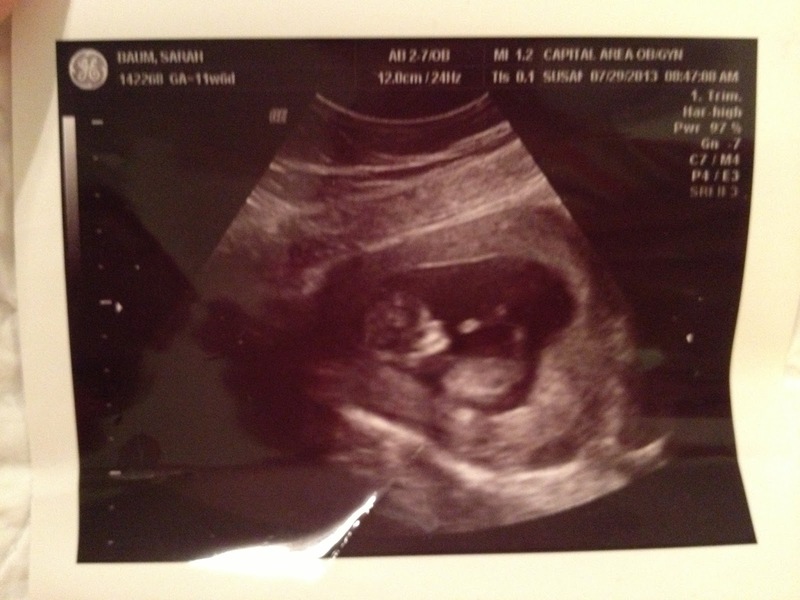 I hate to break it to him, but at this point I still think sweet Baby Baum 2.0 still looks like an alien. We'll let him hope/dream. I have learned quickly that you show a LOT sooner the second time around. 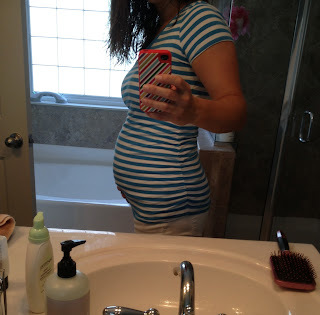 I could still button my normal pants at 12 weeks this time around, but I needed to make sure to wear looser-fitting shirts to avoid the muffin top, and maternity pants were already more comfortable than buttoning my regular pants. 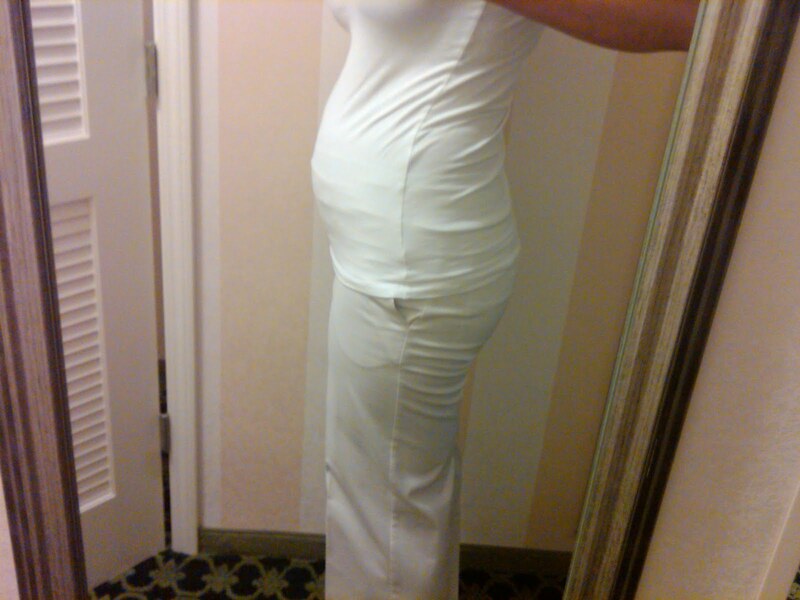 All of my doctors, nurses and girlfriends have told me that this is totally normal, but it’s the one thing so far that has been different from last time – pretty sure my bump wasn’t that size until the end of October with L. As a result, I have NO weather-appropriate maternity clothes. Luckily my sister let me borrow a few of hers. I just hope I am not carrying around a tiny whale/elephant in there, oy! At the end of this appointment, I scheduled an appointment for 16 weeks. I asked if I got an ultrasound, to which they replied no, so that either means they'll make me wait until 20 weeks for the gender OR they will let me come in for just an ultrasound at 18 weeks (fingers crossed). That’s all for now, and I think I’m almost caught up wahoo!! Oh wow I forget how quickly those little babies grow! 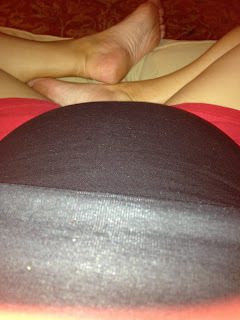 At just 12 weeks that baby LOOKS like a baby in the u/s pic! Amazing.